The Idea is the biggest company in India. It has millions of customers. Idea provides better services for its customers. But unwanted calls or messages are also delivered by the company for the promotion. When you are doing some important work or sleeping than unwanted or promotion call or message disturb you. Then you are seriously very angry about this. That’s the main reason when I suggest you activate Idea DND. If you want to know more about Idea DND(Do not disturb) service than please continue read us this article. In this article, I will explain all the things about Idea DND Service. Unwanted calls or SMS really frustrate you. Customers really want to stop these unwanted calls and SMS. For this, they need to activation Idea DND Service. 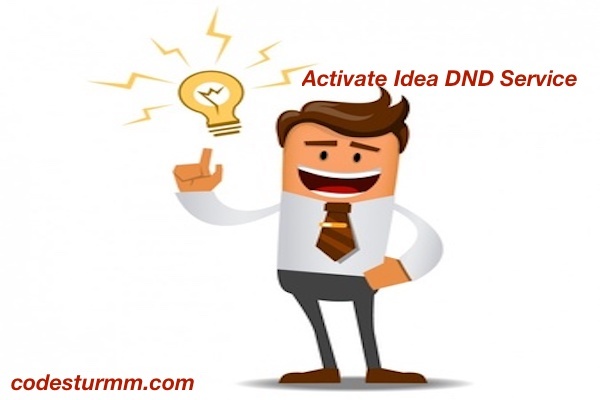 For Activation of Idea, DND Services Customer can use these two methods. I will provide information and direct link here for checking your number DND services or⚙ now get registered after applying this method just click on the given link below🔗 and follow the process. The DND means Do not disturb. These Services are provided by all the companies free of cost to their customers. The National Customer Preference Register (NCPR), formerly the National Do Not Call Registry (NDNC), is intended to give Indian consumers an opportunity to limit the telemarketing calls they receive. The Telecom Regulatory Authority of India (TRAI) is the Indian governmental agency tasked with defining various policies and regulations for wireless communication service providers in India. As per TRAI regulation, every mobile service provider in India is required to set up a National Customer Preference Register (NCPR). In practice, various service providers refer to it as the Do Not Disturb (DND) registry. Telemarketers, after registration from TRAI, receive permission to access the NCPR. The customer preference portal on TRAI website details the official rules regarding registry setup and the procedure for registering on the ‘do not disturb’ registry. The actual administration of the registry is done by TRAI, neither via this portal nor anywhere else. The administration is left to individual service providers.